Meyer, David. "Niska Archaeological Site". The Canadian Encyclopedia, 04 March 2015, Historica Canada. 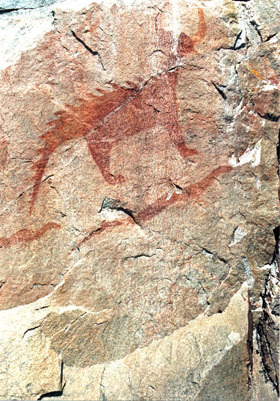 https://www.thecanadianencyclopedia.ca/en/article/niska-archaeological-site. Accessed 23 April 2019. The Niska site (Borden No. DkNu-3) covers an area of 64 ha in southwestern Saskatchewan, east of the town of Ponteix. Excavation, 1983 (courtesy David Meyer). Soil profile, 1983 (courtesy David Meyer). Two stemmed points reworked as knives and four Cody knives from the Niska Site (courtesy David Meyer). 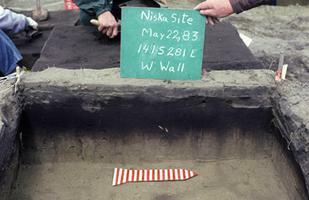 The Niska site (Borden No. DkNu-3) covers an area of 64 ha in southwestern Saskatchewan, east of the town of Ponteix. It was discovered in the 1960s by a local avocational archaeologist, Henri Liboiron. At that time, severe wind erosion had exposed many artifacts on the surface of a field. These included two stemmed "points" that appear to have been "recycled" as knives, as well as three point stems, four Cody knives and 12 endscrapers. Liboiron also collected a number of lithic flakes from the cultivated surface. 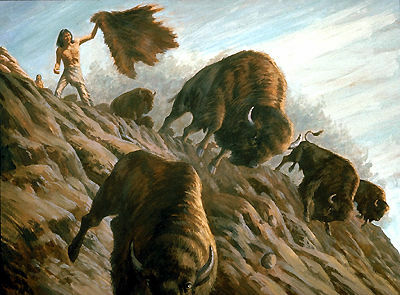 These discoveries showed that the Niska site had been occupied by a Palaeoindian cultural group referred to as the Cody complex, which is an archaeological unit defined in 1951 to identify classic Early Aboriginal plains bison hunters. A Cody complex site is notable for the presence of stemmed projectile points of the Scottsbluff and Eden styles and specialized cutting tools referred to as Cody knives. Test units were dug at the site in 1981 and 1982, revealing the presence of some sections that were below the plow zone and, therefore, undisturbed. Since an undisturbed Cody complex occupation had not previously been encountered in Saskatchewan, this site was immediately recognized as having great importance. 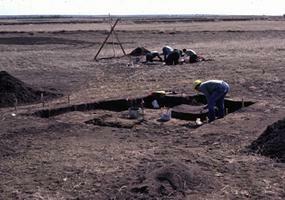 Therefore, in 1983, two small excavation blocks, 12 m apart, were opened in intact portions of the site. The westerly block, encompassing 16 m2, produced 176 waste flakes and an exhausted bifacial core of brown chalcedony. Also recovered were the stem of a projectile point, an endscraper and many bits of a bright red paint material. A sample of this paint was subjected to X-ray diffraction analysis, identifying it as hematite. A number of pieces of disintegrating bone were also recovered, three of which were identified as bison while some fragments of a calcined bone were of a small rodent. As well, there were three concentrations of burned and calcined bone fragments in an area about 1.6 m across. This was identified as a hearth location. The smaller (8 m2) easterly excavation block yielded 349 waste flakes as well as a perforator/spoke shave, two point stems and four endscrapers. Red paint material was sparse here. Numerous unidentified bone fragments were recovered. Some of these had been burned and calcined but there was no concentration suggestive of a hearth. To date this occupation, a sample of bone was submitted for radiocarbon dating. This produced a date of 7,165±320 BP (Before Present; "present" indicates c. 1950). Cody complex occupations on the adjacent American plains date in the period 9400-8600 BP, so this date was considered too recent. In an effort to obtain a more accurate date on the occupation, archaeologists returned to this site in 1986 and excavated another 3 m2 of the western block in order to recover additional bits of charcoal. These were believed to relate to the hearth there and yielded a radiocarbon date of 8475±650 B.P. Given the uncertainties of radiocarbon statistics, this date is acceptably close to the usual time range of the Cody complex. The lithic materials of the tools and debitage recovered from the excavation blocks were the same as those of the specimens that Mr. Liboiron had collected from the surface. This means that the excavated and the surface-collected tools almost certainly derive from the same occupation. Seventy percent of the debitage as well as all of the excavated tools were of brown chalcedony. This material is not found in this part of Saskatchewan and it is very likely Knife River flint from west central North Dakota. Also present was fine-grained fused shale (porcellanite) that may have originated in sources in adjacent Montana. The same is the case for the small amount of translucent chalcedony recovered. These foreign materials suggest that the site's occupants were engaged in external trade relations or made long-range collecting expeditions beyond their local territories. The archaeological remains from the Niska site all support the interpretation of this site as a residential camp - a home base. Indeed, six point stems were recovered, evidence that after hunting episodes, foreshafts with these basal fragments still hafted in place were brought back to camp. Evidently, they were then discarded and the foreshafts re-armed with new points. 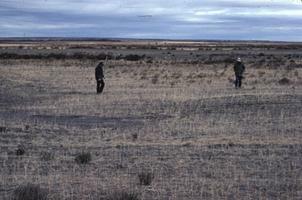 The numerous endscrapers likely relate to hide processing, also an activity most likely to occur in a settled base camp. Similarly, the red paint indicates the possible occurrence of artistic or ceremonial activities, again most likely to have taken place in a home base setting. The site was no doubt occupied by a whole social group, as evidenced by the presence of some tools that were most likely used by women and of others that were likely used by men. Bison meat, and also possibly a small rodent, was roasted at a fireplace, skins were processed and hunting tools re-armed. Since the Niska site was excavated in the 1980s, two other in situ Cody complex occupations, the Heron Eden and Napao sites, have been excavated in Saskatchewan. To date, no older in situ sites have been excavated in the province, although numerous projectile points (eg, Clovis, Folsom, Agate Basin) left by earlier peoples have been collected from fields throughout. See also Aboriginal People: Plains.